In this article, we gona show you how you can easily submit your website or blog to Bing search engine via Bing Webmaster Tools. There are many search engines but Bing / Yahoo also very important factor for webmasters. Search Engine Submission is very important if you want to show your blog or website links in SERPs ( Search Engine Result Pages ) . Now here are two processes of submit URL to Bing search engine, 1 ) without registration 2 ) with registration . You can simply add your URL of your site or blog into Bing webmaster tools. There are many features , if you want to explore this features, then simply sign up free at Bing Webmaster Tools and then proceed. You can also upload your website sitemap with this process. For this purpose, firstly you have a sitemap file ,if not have, then first create this file and then follow below guides. Here is the process of add your URL into Bing search engine without any registration. But if you want to check your URL / site states or all other things then simply register your account on Bing and then add your website URL. Here is the simple process without registration of adding your blog URL to Bing Webmaster Tools. Step 1 – First of all go to Bing Submit URL Site . 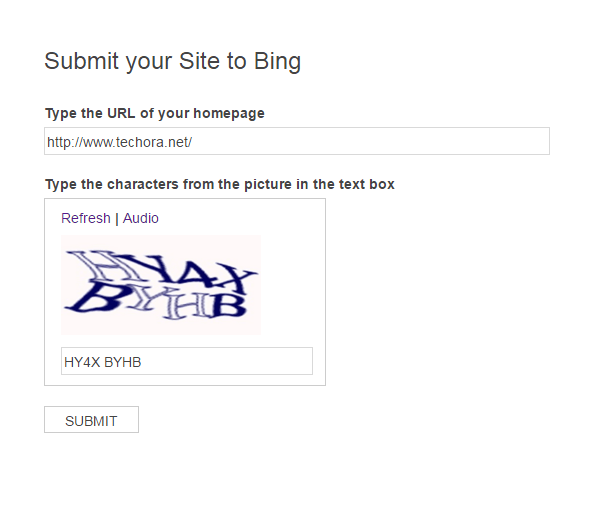 Step 2 – Here write add your blog or website URL on this field and solve the simple captcha. 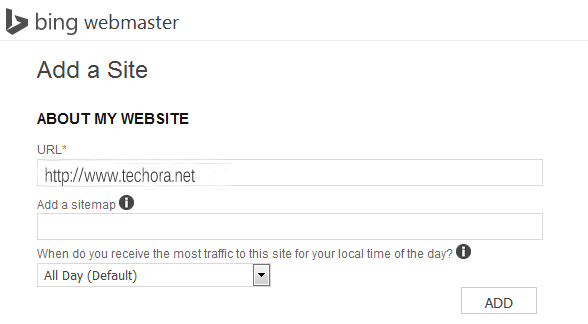 Step 3 – After added your site, click on Submit button. All done ! you will receive a confirmation message at this time , and now Bing will and visit your website very soon. But we always recommended you to added your site with registration, because after registration, you will be able to see out the whole data about your website, indexing, crawling states, errors and Geo targeting etc. So recommended process is 2, to submit your blog with registration. If you not added your site without sign up process, then here you can easily sign up first and then added your site. With registration, you might also get many features , you can also check your performance report about your site URL, errors, and also many other featuers. Step 1 – First of all go to the Bing Webmaster Tools . If you haven’t Bing account, and new here, then simply click on Sign Up button and go through the sign up process. Step 3 – Now select the option ” All Day ( Default ) ” . Step 4 – Now you have done, click on ADD button.